1835 | David W Walton, first settler in this vicinity, which later becomes Durant. 1853 | The Mississippi and Missouri Railroad come to Iowa and survey across the northern part of Muscatine county. 1854 | Benjamin Brayton, a civil engineer for the Rock Island Railroad, comes to the area to negotiate railroad business. Brayton with friends, John Dix and Thomas Durant, change the course of the railroad to go through Cedar County. A town is laid out and platted by Brayton and Mr. Durant donates $800.00 for the erection of a schoolhouse. Brayton names the new town “Durant” in honor of his esteemed friend. Village well dug in June 1854. 1855 | Durant is recorded as a town June 27, 1855. First building in town erected by James Young, a carpenter, in August. 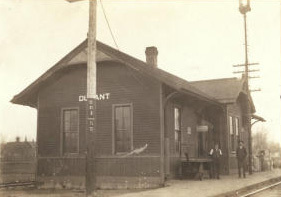 Shortly thereafter the hotel and depot were built. 1858 | First schoolhouse built in the Spring of 1858. 1867 | Durant is incorporated on July 5th, Mr. Allen Nesbitt is elected as first Mayor. The museum hours are Wednesdays from 3:00pm – 6:00pm, and Saturdays from 10:00am – 1:00pm. Appointments by calling 563.320.5046.